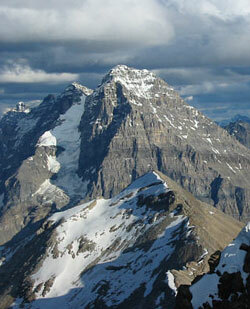 Mount Stephen is the massive mountain which looms almost 2000 metres above the town of Field in Yoho National Park. George Stephen (1829 - 1921) was a former president of the Bank of Montreal when he was named the first president of the Canadian Pacific Railway in 1881. His success in raising the enormous sums of money needed to complete the CPR, was widely regarded as one of the greatest financing feats of its kind the world has ever seen. In recognition of his achievements, he was created a baronet in 1886, and raised to the peerage as Baron Mount Stephen five years later. In 1905, he became Knight Grand Cross of the Royal Victorian Order. 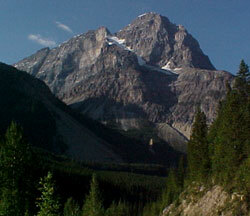 The mountain was named in his honour in 1886. 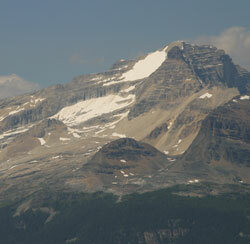 Mr. Stephen, in turn, was named Baron Mount Stephen in 1891 so in this case the mountain was named after the man and the man was named after the mountain. 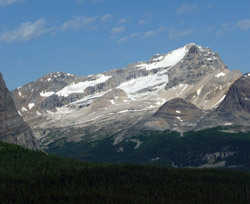 The first ascent of Mount Stephen in 1887 was probably one of the longest and most difficult of the many first ascents made by surveyor James McArthur. 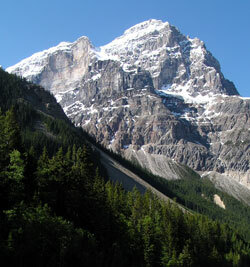 Accompanied by his assistant, T. Riley and burdened by heavy surveying equipment, 1946 vertical metres were ascended including, "crawling along dangerous ledges and up steep narrow gorges." Later they, "moved along to a slanting rift, up which we clambered, sometimes dependent for a hold on the first joints of our fingers." Finally, "It required all our nerve to crawl about the eighth of a mile on the top of those half-balanced masses to the highest point on Mount Stephen." 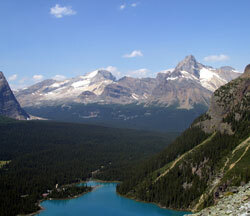 Unfortunately, when they reached the summit, smoke from forest fires obscured the view and limited their photography. 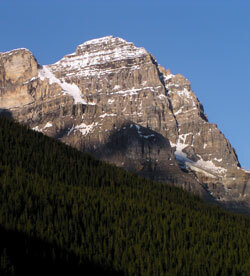 In his book, "Pushing the Limits -The Story of Canadian Mountaineering," Chic Scott refers to J.J. McArthur as "The first Canadian mountaineer," partly on the basis of his efforts on Mount Stephen. 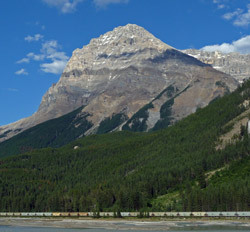 The "Nose Tunnel" passes through the lower cliffs of Mount Stephen above the point where the Yoho Valley joins the Kicking Horse River near the Trans-Canada Highway. This tunnel was part of the original CPR construction and every train since has passed through it. 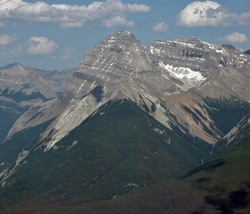 During the construction of the railway, lead-zinc ore was discovered in loose rock lying below Mount Stephen. 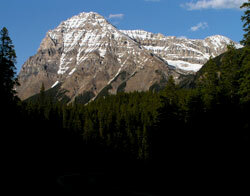 This led to the Kicking Horse Mine being built on the opposite side of the valley in Mount Field, just above the lowest portion of the Yoho Valley Road and the Monarch Mine in the lower cliffs of Mount Stephen on the opposite side of the valley. Lead and zinc were mined from time to time ending in 1952. 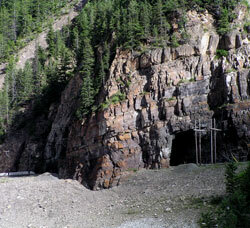 Two or three of the openings for the Monarch Mine can still be seen in the northern cliffs, above the talus slopes on the northern end of the mountain above the bridge at the bottom of the Big Hill. A cable car that began at the railway to the east was used to access the operations on the cliffs.